The road to power... is paved with blood and magic. At the heart of the fray are four brave young people grappling for that magic and the power it promises. For Cleo, the magic would enable her to reclaim her royal seat. In Jonas's hands, it frees his nation, and in Lucia's, it fulfills the ancient prophecy of her destiny. And if the magic were Magnus's, he would finally prove his worth in the eyes of his cruel and scheming father, King Gaius, who rules Mytica with a punishing hand. When Gaius begins to build a road into the Forbidden Mountains to physically link all of Mytica, he sparks a long-smoking fire in the hearts of the people that will forever change the face of this land. For Gaius's road is paved with blood, and its construction will have cosmic consequences. PEOPLE!! This book OMG this book!! Morgan Rhodes has crafted a fantasy that is so brilliant and just my gawd just everything I have EVER wanted in a fantasy novel. This is YA at its absolute finest and my favorite book of 2015! Rhodes definitely does not suffer from middle book syndrome. 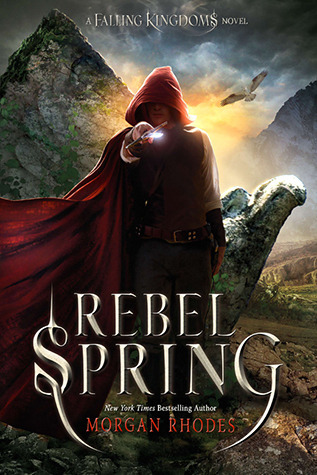 Rebel Spring is just as explosive as its predecessor and honestly even more so in some areas. The story is so intricately woven throughout that every page has a purpose. There are no wasted words or filler here let me tell you. I am completely blown away by what this author has created. COMPLETELY! Again I won't go into the story because it's a very complicated one and one that I know I won't do justice to. And honestly I don't want to spoil it for anyone. The story is that good to where I would totally tell all my friends to go in blind. Don't read a synopsis, don't read a summary, just go in and experience. I have never said that before so that should tell you something. I've come to find out that Rhodes is fearless with her characters and will kill anyone off at the drop of hat. I think she's killed off like ten people so far and everyone of them was important! Who does this!!?? Even after so many have been killed off I still find myself shocked when it happens. I'm beginning to get a little blood lust myself though because now when I smell death in a scene I'm starting to chant die die die! This I know can't be a good thing, but I blame Rhodes and her fearlessness! The characters have continued to grow and change and a few scare me more in this one. Magnus is a loose cannon and I'm terrified of what his plans ultimately are. I'm also finding is fascinating that so many characters have an evil streak! This appeals to the darker side of me and I love it! I was shocked at quite a few dark turns this book took, but it totally fits right in with the story and I have no complaints. One thing I find hilarious is the romance in this series. I've just said that Rhodes will kill anybody and this has proven to serve more than one purpose. I despise love triangles and throughout this story I've smelled a few of them. Well let me tell you if these pesky triangles bother you too, then you need not worry. Every time I would groan and think NO I don't want a triangle within a few chapters one side of the triangle would meet their end. LOVE THIS! I again know this isn't quite normal for me to feel, but really what better way to deal with triangles?? I think this should be standard in books now with love triangles! I'm beyond excited to continue on with this series. It is beyond epic and one that I will definitely not let fall to the wayside as I have done with so many series as of late. Bring on Gathering Darkness! Just finished Falling Kingdoms about an hour ago, and loved it! I'm so ready to start this one. Though, I have to put it on hold at my library. Hopefully, the wait isn't long. Great review! YAY! Oh you are going to love this one even more!! I'm starting Gathering Darkness soon! I will definitely be on the look out for you review! I haven't read Falling Kingdoms yet and it's been sitting on my shelf forever. Now I'm convinced that I should read as my Morgan Rhodes books as possible!